Naneghat FortHeight : 2500 ft. While going through Malshej Ghat, we can easily get a glimpse of Naneghat after Murbad. The significantly shaped thumb-like peak and the pinnacle of Vandarlingi are the most distinctly seen spots. This was the most important trade route, as it connected harbour of Sopara and Kalyan directly to Junnar and Paithan. The name itself suggests that it was a famous and significant route. �Nane� means famous. Today it is a good trekking spot for trekkers and tourists. Bor Ghat, Malshej Ghat and Naneghat were the foremost road links for commuting coast to the plateau. The Satvaahans had made Naneghat their main route to Junnar. During their tenure the most important way of commuting was Naneghat, which linked Kalyan & Sopara to Paithan. Today one has to reach Junnar by going all the way through Malshej, which is a big round. But Naneghat had much reduced distance and was a definitely shorter route. However, as time proceeded, it was destroyed by alien rulers and then paid no attention. The first thing we can see after reaching Naneghat is the spacious cave of Naneghat. The ancient carvings, which are seen on the walls of the cave, remind us of the Satvaahan period. Here we find inscriptions in Brahmi script all over the cave. These indicate the magnificent era of the Satvaahans and their generosity. These inscriptions are gradually being destroyed, and only a part of it is remaining. The inscriptions are very precious, and are undergoing destruction due to the negligence of Archeology. The widely spread plateau of Naneghat is an astonishment. To the left the steps besides the cave lead us to the plateau and going to the right lead us to Nana's thumb. After climbing all the way to the bottom of the thumb, when we climb the stairs, we do not expect a big plateau. Thus this route leads directly to a higher altitude quickly, unlike Malshej Ghat, which goes all around the mountains. At the entrance to the Ghat is a big stone-made vessel like thing, in which coins as toll were put. Naneghat lies to Northwest of Junnar at 27 km. State Transport buses (S.T.) plying regularly from Kalyan to Ahmednagar help us to reach Vaishakhare. From Vaishakhare at about 4 km a diversion towards Naneghat originates. A stone on which is written Malshej 29 indicates the diversion towards Naneghat. 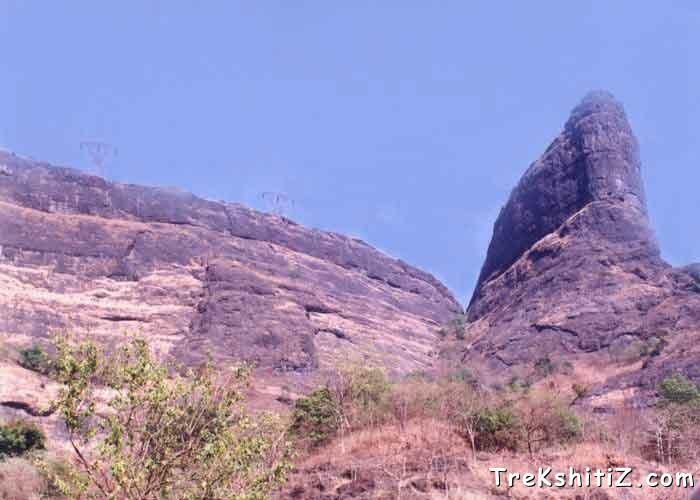 A thumb shaped cliff that can be viewed from the highway is the topmost point of Naneghat & is also known as Nana's thumb. Today there is board that specifies diversion to Naneghat. The next way, if we want to go from Poona or Junnar to Naneghat, is to board the Junnar-Ghatghar S.T.bus & to reach Ghatghar. A half an hour run take us to Naneghat. Private buses can reach up to the mouth of the Ghat. Nearly 50 persons can be accommodated at a time easily in the cave, which is the only place for accommodation. We have to carry our own food. Near to the cave we can find three small water reservoirs of which the last one provides the drinking water.